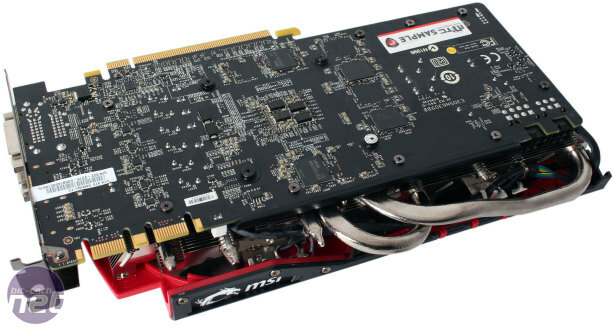 Rounding out the trio is MSI's GeForce GTX 970 Gaming 4G, which comes in at £282; the lowest on test. Its base clock of 1,140MHz is faster than ASUS's but slower than EVGA's. 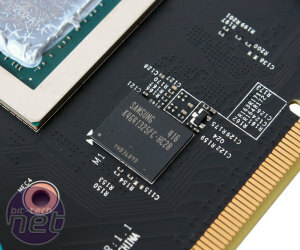 It is a 9 percent gain over stock, and gives it a boost frequency of 1,279MHz. Memory is clocked at the standard 7GHz. The card measures 269mm long, so it's a touch shorter than ASUS's Strix card, though both cards have the same extra tall coolers that take the height to around 140mm. 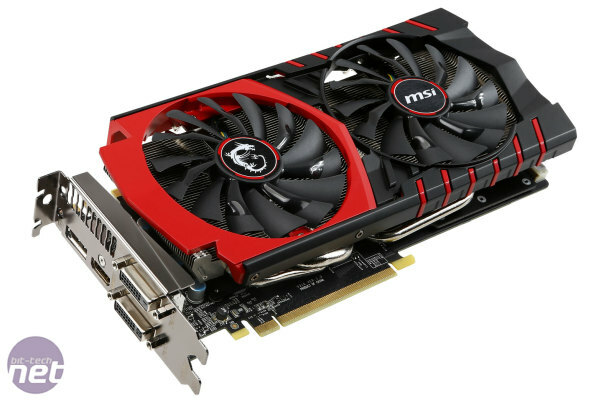 It's a dual-slot card like the others, though it's actually a few mm under the requirement for dual-slot, and MSI claims that this aids airflow in tightly cramped SLI situations. 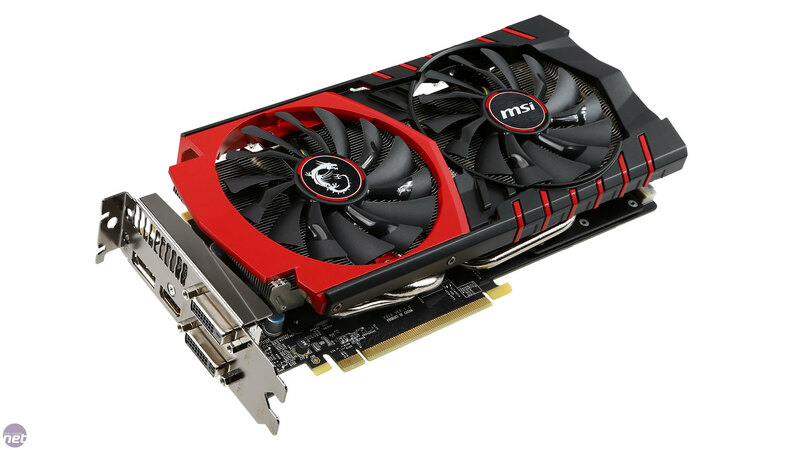 As well as a DVI to VGA adaptor and a 6-pin to 8-pin PCI-E power upgrade cable, we understand that the MSI card will be supplied with a free mouse pad too. The reason for the 8-pin upgrade cable is that this card is fed by a 6-pin/8-pin combination rather than the default dual 6-pin set-up. Hopefully this additional power brings about higher stable overclocks. The Twin Frozr V cooler has a plastic shroud, though it's well built, and an aggressive and attractive red and black colour scheme that suits the all-black PCB well. 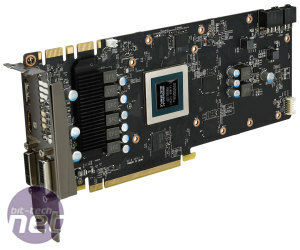 The card has no backplate, leaving four of its eight memory chips exposed on the rear side. The dragon and MSI logos on the side just above the pair of SLI connectors are backlit by white LEDs. There is no way to disable this other than by unscrewing the cooler and disconnecting the cable. 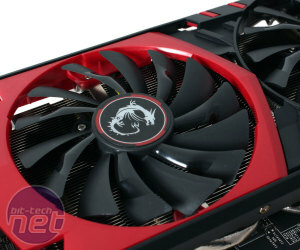 Please note that a number of pictures in this review are supplied by MSI. This is at the company's request and is due to a minor aesthetic difference between our early sample and the final retail version that only affects the I/O panel. The quartet of connectors is the same as with the other cards. 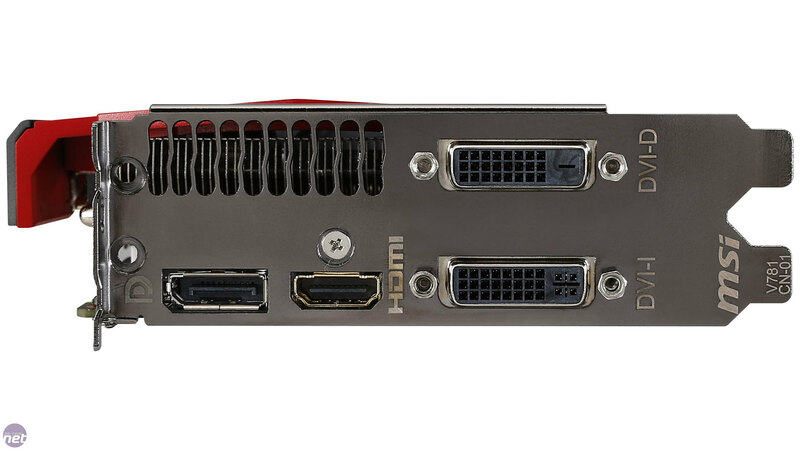 We think it a shame that no AIC here has opted for the upgraded triple DisplayPort connectivity seen on the GTX 980, though admittedly it may have driven up costs to do so. 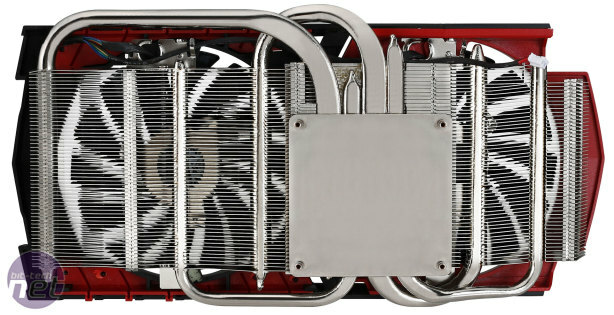 The Twin Frozr V cooling solution is the latest in the series. 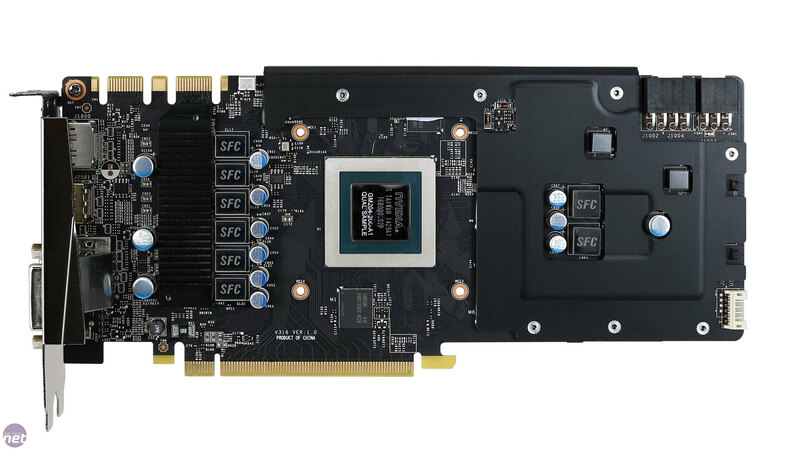 The GPU is cooled by a massive nickel-plated copper baseplate, to which the four heat pipes (two 8mm, two 6mm, also nickel-plated) are soldered to. 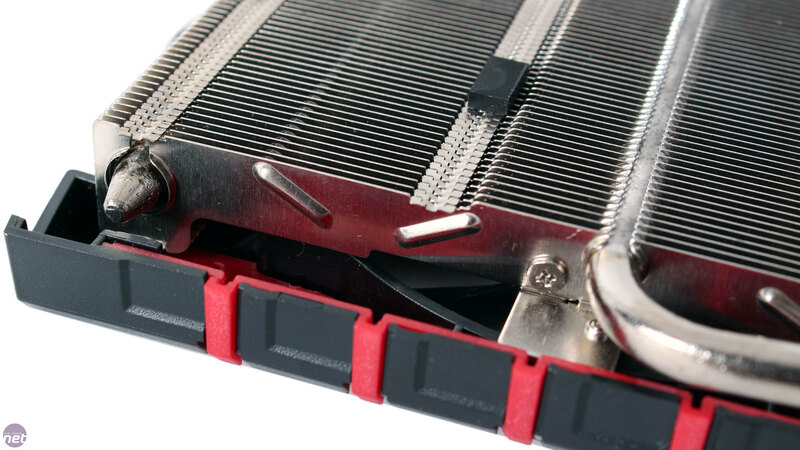 This design ensure heat is transferred through all the pipes effectively, unlike in the EVGA solution where one of the pipes barely connects with the GPU. One heat pipe is S-shaped, while the remaining three are U-shaped, a design MSI refers to as SuperSU and claims helps to improve heat dissipation throughout the aluminium fins. Two 100mm downdraft Torx fans provide airflow, with MSI boasting their new fan design offers 19 percent better airflow and five percent less noise (at 100 percent fan speed). The fan blades alternate between traditional blades that direct airflow to the heatsink, and dispersion blades with a small ridge in them that draw in more air and push it into the path of the normal blades blades, essentially accelerating the airflow. The fans are also wider than the fin stack, ensuring airflow covers the whole card and more. Angled metal ridges run through the fin stack. 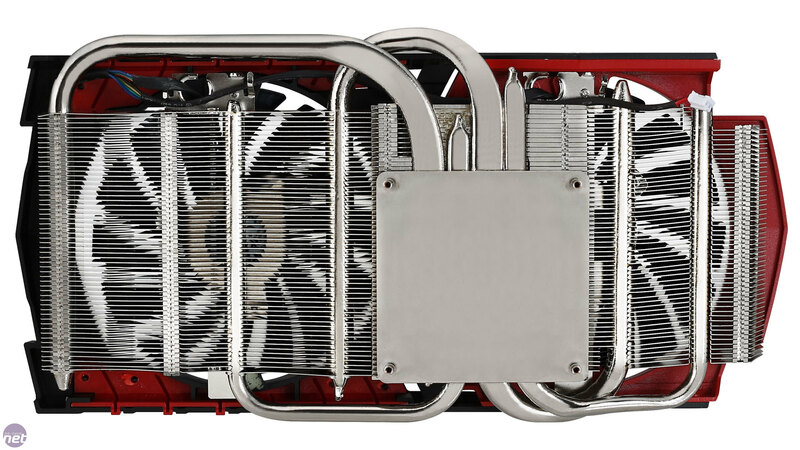 This is something MSI calls Airflow Control Technology, and they essentially direct air towards the heat pipes for maximum cooling efficiency. The cooler shroud is very open, so air will predominantly be exhausted into your chassis. 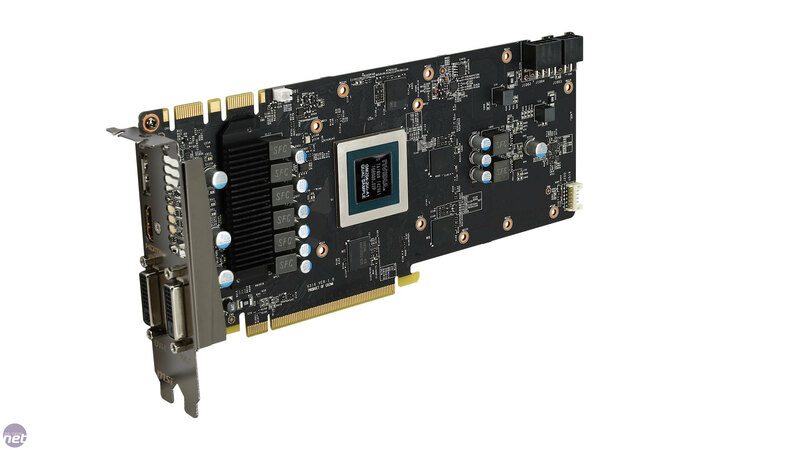 Like the ASUS card, the GTX 970 Gaming 4G features a semi-passive mode, which it calls Zero Frozr. It's something MSI first brought to the market in 2008 (it's keen to clarify that it hasn't copied the ASUS Strix cards here). 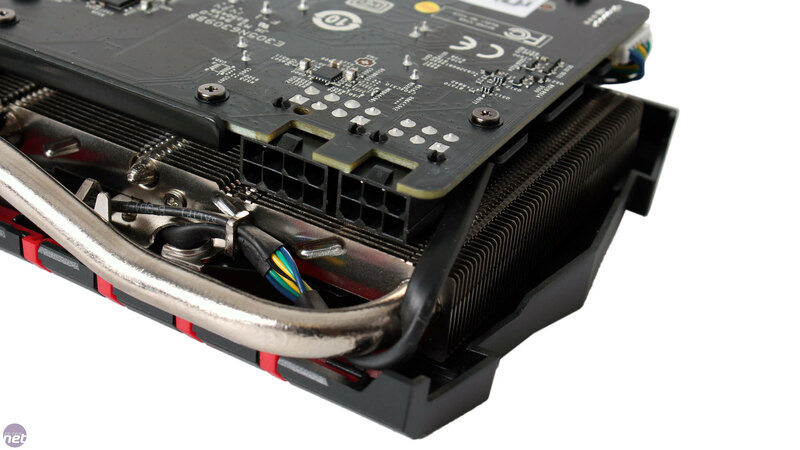 The temperature cut-off points are similar to the ASUS card – between 60 and 65°C, the fans will spin up; once the GPU drops to about 50°C, they're no longer needed. This carries benefits for noise production, efficiency and fan lifespan. Another feature is called Hybrid Frozr, and this refers to the ability to control both fans independently. 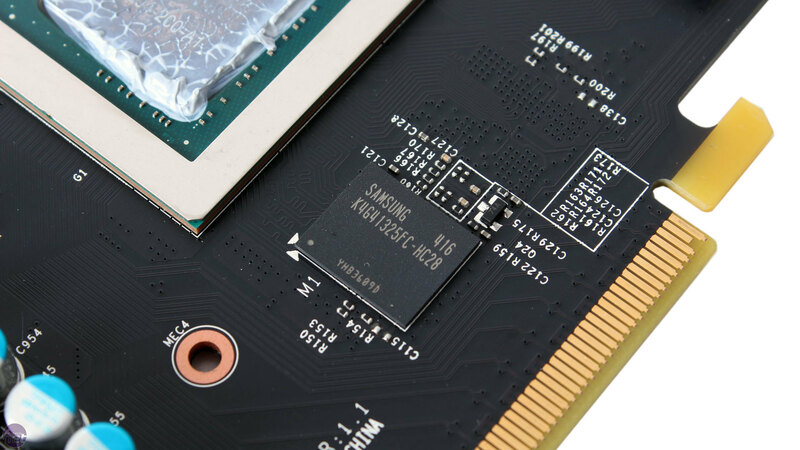 Enabling this functionality is a six-pin fan header on the PCB. In automatic mode, one fan is controlled by the GPU temperature while the other is controlled by temeprature measurement ICs dotted around the PCB. 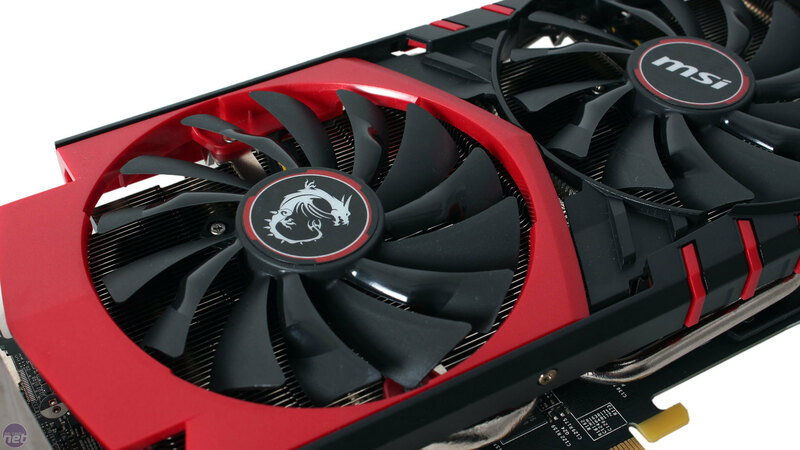 MSI claims it can result in a 1.9dB(A) noise reduction, and also offers users the ability to control the two fans independently using its Gaming App. The power delivery is the best of any here; it's a 6+2 design. 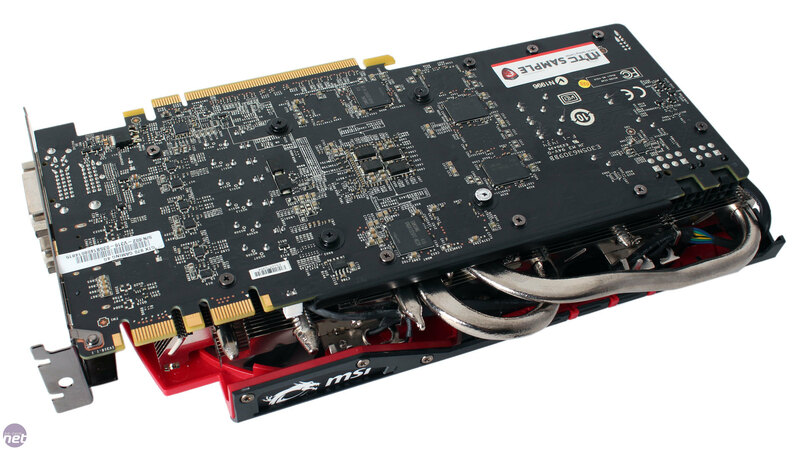 Further, MSI uses its own improved components for both the GPU and the memory power phases. The components are referred to as Military Class 4 since they meet MIL-STD-810G regulations. Specifically, we find Hi-c CAP and Solid CAP type capacitors and Super Ferrite Chokes, which are designed to provide higher stability, lifespan and efficiency. 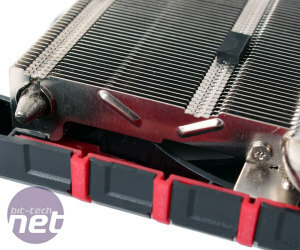 A miniature heatsink takes care of cooling the main GPU MOSFETs near the rear I/O, while a metal contact plate equipped with thermal pads is used to cool three of the four front PCB memory chips as well as the remaining power circuitry including the memory MOSFETs and the VR controllers. At long last, AMD's new Polaris architecture is here - let's see what the RX 480 can do.